The UK Research and Innovation Global Challenges Research Fund is investing in 12 research hubs across the world over the next 5 years. One of these is the TRADE Hub, which aims to make trade a positive force for both people and nature conservation. The project, led by UNEP-WCMC and involving over 50 partner organisations including the University of Oxford, will study patterns of trade in wildlife, wild meat and agricultural goods to gain a more robust understanding of how different systems of trade affect biodiversity, with the aim of finding solutions for minimising these impacts. The TRADE Hub will focus its efforts primarily on eight countries: Brazil, Cameroon, China, Democratic Republic of Congo, Gabon, Indonesia, Republic of Congo, and Tanzania. More here. Legal Atlas provides a highly specialized and customizable legal intelligence platform that can be used to gain insight into the laws governing illicit activities, including wildlife trade by enabling the rapid and comprehensive compilation and comparison of applicable sanctions. It is currently supporting the WILDS project (researching how sanctions against IWT can better reflect impacts to society) and the Legis-Ape project (a legal systematic assessment for the conservation and protection of great apes and gibbons). Legal Atlas has also recently been used to review wildlife cybercrime law and the application of anti-money laundering laws to wildlife trade crimes supporting the Global Initiative Against Transnational Organized Crime and the UK Foreign and Commonwealth Office. How anyone can help saigas, right now from their computer, without donating any money or major amounts of time? Working in a saiga antelope consumer country I’ve become increasingly aware of one small truth, most consumers of saiga horn have never even heard of the word ‘saiga’. Now, this is none too surprising given the fact that saiga is the English common name (as well as Latin genus name), and many consumers do not speak English. But what may be surprising, is that many consumers in our study area, and beyond, have no idea what the animal is at all, let alone how the horns are procured, what countries it lives in, and what its conservation or trade status is. (FYI for soon-to-be converted saiga people, it’s a Critically Endangered antelope from Central Asia). So how did this come to be? Especially given the fact that we live in a world where the globe is so interconnected on the internet, how is it that a consumer has no idea what product they’re buying? It’s actually quite easy. If you are a consumer, you know of saiga only as ling yang (羚羊), a traditional Chinese medicine (TCM) you purchase to treat ailments such as a fever or a cough. So when you search online for information regarding this medicine (what quantity to use, where to buy it, how effective it is), all you will ever see fed back to you is information from other sources referring to the product as ling yang. Thus exists two parallel worlds. One with saiga, the ungulate under major poaching and disease impact, and one with ling yang, the medicinal product. And these non-overlapping realities just reinforce the gap between those interested in saiga versus ling yang. How many other species live in such dichotomous perceptions? Where the consumer and conservationist view the same plant or animal in two entirely different ways, with little to no cross-over in information, discussion, or understanding. I can posit quite a few. 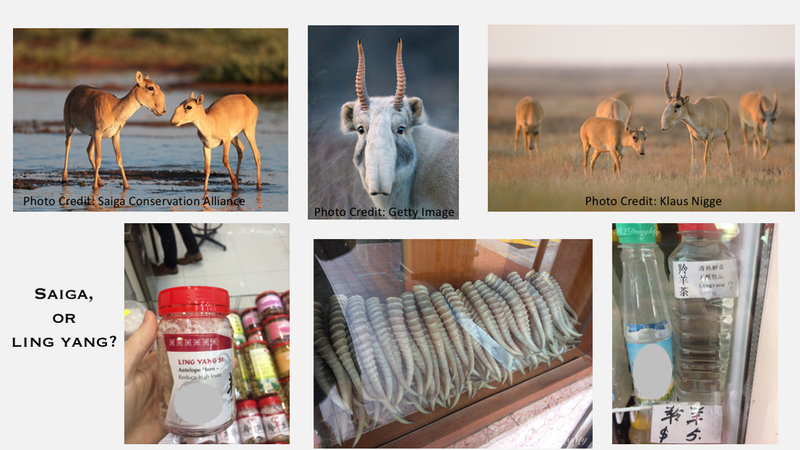 My call to saiga people the globe over is, therefore, to start integrating the pinyin and Chinese characters into everything: all saiga conservation and research webpages or posts that mention saiga horns as used in TCM, no matter the language. Our goal is for ling yang users to start seeing webpages, social media posts, and news about saiga, whenever they look up info on the horn as a medicine. Combatting the entire issue of unsustainable demand will not, in truth, be solved by this little fix, but I would argue that it is a critical, and necessary, step to at least providing an opportunity for consumers to know more about the medicine in their medicine cabinet that we know of as saiga. As a note, ling yang in Chinese usually means just antelope (or wild antelope), but in the context of TCM, it is almost always referring to saiga antelope horns. Oxpeckers Investigative Environmental Journalism recently launched a new interactive geojournalism tool, #WILDEYE, which is being used to track illicit wildlife trade throughout Europe by mapping seizures, arrests, court cases and convictions. People Not Poaching, a Communities and IWT Learning Platform recently launched as a positive new initiative to foster learning and experience-sharing on supporting and engaging communities in initiatives to reduce poaching and IWT. It is a joint project between the IUCN CEESP/SSC Sustainable Use and Livelihoods Specialist Group (SULi), International Institute for Environment and Development (IIED) and TRAFFIC. Researchers from the Oxford Martin Programme on the Illegal Wildlife Trade have been invited by the UK government’s Department for Environment, Food and Rural Affairs (Defra) to take part in a new consortium of specialists in demand reduction and behaviour change, as part of efforts to tackle the global trade in illegal wildlife products. The Global Wildlife Cybercrime Action Plan is aimed at improving co-ordination across the public and private to tackle the online trade in illegal wildlife products. The plan brings together a number of major organisations and expertise working on combating the illegal wildlife trade, including IFAW, INTERPOL, Oxford Martin Programme on the Illegal Wildlife Trade, the Durrell Institute of Conservation and Ecology (DICE) at the University of Kent, TRAFFIC and WWF. On October 9, 2018, the Oxford Martin Programme on the Illegal Wildlife Trade, BIOSEC University of Sheffield, Lancaster Environment Centre, the Durrell Institute of Conservation and Ecology and the Zoological Society of London held the event, Evidence to Action: Research to Address the Illegal Wildlife Trade. Read the full event summary here. The Oxford Martin Programme on the Illegal Wildlife Trade (OMP-IWT) is thrilled to announce its 2nd Symposium on Illegal Wildlife Trade (IWT), which will be hosted in partnership with BIOSEC University of Sheffield, Lancaster Environmental Centre, the Durrell Institute of Conservation and Ecology and associated with the Royal Society. The meeting will be held in Central London prior to the 2018 London IWT Conference. The first day, on October 9th, will bring together those carrying out research addressing IWT, and their collaborators from around the world, to discuss new ways to address this global threat more effectively. The second day, on October 10th, will be reaching out to government representatives attending the London Conference, and other colleagues in a range of sectors, with interactive discussions and exhibits on IWT research. More information will be available in the coming weeks. Stay tuned and save the date! Advances in technology and connectivity across the world, combined with rising buying power and demand for illegal wildlife products, have increased the ease of exchange from poacher to consumer. As a result, an unregulated online market allows criminals to sell illegally obtained wildlife products across the globe. Purchasing elephant ivory, tiger cubs, and pangolin scales is as easy as click, pay, ship. Fortunately, the world’s biggest e-commerce, technology, and social media companies (such as eBay, Google, Microsoft and Tencent) have joined forces to shut down online marketplaces for wildlife traffickers. The Global Coalition to End Wildlife Trafficking Online brings together companies from across the world in partnership with wildlife experts at WWF, TRAFFIC the wildlife trade monitoring network, and the International Fund for Animal Welfare (IFAW) for an industry-wide approach to reduce wildlife trafficking online by 80% by 2020. For more information and how to get involved, see here. In mid-February, the Association of Zoos and Aquariums (AZA) and the U.S. Wildlife Trafficking Alliance (USWTA) announced their joining of forces in a united effort to fight the global epidemic of wildlife trafficking. San Diego Zoo Global, along with several other conservation-based accredited zoos, has pledged to support this effort through action, leadership and resources. Beginning in 2015, the USWTA assembled an impressive coalition of corporate and nonprofit member organizations, all working together to raise awareness about the devastating impact that wildlife trafficking has on wild animals and to help stop consumer demand for endangered species products. AZA is a founding member of the USWTA. This summary has been abridged from IISD Reporting Services. The CITES SC69 meeting took place on 27 November – 1 December, 2017 in Geneva, Switzerland. John Scanlon, Secretary-General of CITES began the meeting by highlighting a recent UN General Assembly Resolution on tackling illicit trafficking in wildlife and called for increased efforts to put trade in CITES-listed timber on a legal and sustainable footing. He stressed the SC’s “supportive and non-adversarial” approach to CITES compliance matters. SC Chair Carolina Caceres (Canada) noted the packed agenda at SC69 and urged participants to summon a “spirit of collaboration” in order to complete the work required before SC70 and the 18th meeting of the Conference of the Parties (CoP18). The SC considered administrative, financial and compliance issues, including on introduction from the sea of specimens from the North Pacific population of the sei whale. Switzerland announced it would provide 1 million Swiss Francs to the CITES Secretariat each year, starting in 2019, pending approval by its parliament for the budget increase. Sri Lanka announced the dates for CITES CoP18 in Sri Lanka (May 22 – June 3 2019). Issues of Malagasy timber trade, with the agreement to maintain the recommendation for parties not to accept exports or re-exports for commercial purposes from Madagascar of specimens of Diospyros and Dalbergiaspp. Elephants and ivory, specifically commending efforts made or that are underway to close domestic ivory markets, and addressing progress on National Ivory Action Plans (NIAPs), including concerns related to the Elephant Trade Information System (ETIS) methodology. Parties including China, Hong Kong, Kenya, the Philippines, Thailand and Uganda were commended for the progress the Standing Committee considered they had made. Matters of food security, livelihoods, engagement of rural communities in CITES and terminology related to local, indigenous and rural communities. Interventions from participants included pleas to consider the effects of CITES decisions on local people. This led to the agreement of a revised mandate for an intersessional working group. Cooperation with other biodiversity related conventions, including the Food and Agriculture Organization of the UN (FAO), with special reference to the scientific and technical evaluation of listing proposals for commercially exploited aquatic species. Combating wildlife cybercrime: at an event held alongside CITES SC69, the International Consortium on Combating Wildlife Crime (ICCWC) announced new EU funding to step up the fight against illegal wildlife trade, totalling USD 20 million for the implementation of the ICCWC Strategic Programme 2016-2020. Disposal of confiscated specimens and specimens produced from synthetic or cultured DNA. Various species-specific issues were raised including: Humphead wrasse, illegal trade in Tibetan antelope, rhinoceroses and interpretation of annotation #15, cheetahs, sturgeons and paddlefish, sharks and rays, African lion and illegal trade in eels, rosewood timber species, tortoises and freshwater turtles. With regards to pangolins, deliberations primarily focused on interpretation of CITES Res. Conf. 13.6 and in particular, whether specimens of pangolins acquired before the species were listed in Appendix I in 2016 should be treated as specimens of species in Appendix I or II. The Standing Committee agreed that guidance on interpretation of this Resolution in this context should be provided by the CoP, and advised Parties that in the interim they should treat all specimens of pangolins as specimens of species in Appendix I. This issue will now be discussed at CoP18. As part of the Oxford Martin Programme on the Illegal Wildlife Trade, we aim to translate our research into impact, by creating a set of Tools & Guidance, in collaboration with and for ongoing use by, stakeholders working within the illegal wildlife trade. Our Tools & Guidance will be grounded within the specifics of our research, yet we wish to have full involvement of stakeholders throughout the process so what we produce is useful for the wider global community working to address wildlife trade. Thus, we are requesting your input to help us ascertain interest, need and help guide our direction. UK Department of Environment, Food & Rural Affairs, Foreign & Commonwealth Office and Department for International Development have announced the London 2018 Illegal Wildlife Trade Conference will be held October 10-11, 2018. This will be the fourth consecutive conference on IWT, after London in 2014 through to Kasane in 2015 and Hanoi in 2016, with aims to bring together international leadership and secure political commitment to bring an end to IWT. The conference was launched by ministers together with NGOs, academics and key countries affected by IWT, after the government announced new plans to ban ivory sales in the UK. Prior to doing so, Defra is seeking public views and evidence on what the effect of this measure will have. Consultations close December 29, 2017, so submit your perspectives and additional documentation to substantiate soon, if you haven’t done so already. In September 2016, the University of Sheffield launched the project, Biodiversity and Security: Understanding environmental crime, illegal wildlife trade and threat finance (BIOSEC). Running until August 2020, BIOSEC is funded by the European Research Council (ERC) and is led by Professor Rosaleen Duffy in the Department of Politics. The project examines the growing links between biodiversity conservation, militarisation and global security concerns, including the caviar trade within the EU, use of green surveillance technologies in conservation and the impact of illegal wildlife trade in both source and end user countries. To find out more about the BIOSEC team, their current research and upcoming events, you can visit their website, follow BIOSEC on Twitter and read a copy of their latest newsletter. Free the Bears, TRAFFIC Southeast Asia and the IUCN Bear Specialist Group are pleased to announce that the first international symposium dedicated to the conservation and management of the world’s smallest ursid – the Sun bear – will be held from the 4th to 6th September 2017 in Kuala Lumpur, Malaysia. The symposium will bring together field researchers, conservation managers, environmental educators and conservation breeding specialists, as well as government and industry representatives to share experiences and create a coordinated plan for the conservation of one of Southeast Asia’s least known large mammals. The symposium will be designed to encourage presentations and discussions that will contribute towards a range-wide conservation strategy for Sun bears which will be developed during a conservation planning workshop to be held on the 7th and 8th September, immediately after the symposium. Find out more here or contact for further details. The majority of species traded are plants and orchids are one of the main taxonomic groups. This includes the international horticultural industry, ingredients in traditional medicines, high-end cosmetics, and edible products. Every orchid species is listed in the CITES, accounting for >70% of all species listed by the Convention. Recognising the importance of this trade and the conservation implications of unsustainable exploitation, in October 2016, the IUCN Species Survival Commission Orchid Specialist Group established a new sub-group focused on the global orchid trade. The sub-group aims to generate and coordinate expert inputs on the trade of orchids and their derivatives, to inform domestic regional and international conservation and sustainable use efforts. This includes engaging with policy makers, practitioners and the public to provide information and expertise and raise the profile of orchid trade. The University of Cambridge, in collaboration with the Oxford Martin Programme on Illegal Wildlife Trade, are planning to undertake a Conservation Evidence project to identify and gather evidence of interventions that have been or could potentially be implemented to tackle all stages of the illegal and unsustainable wildlife trade. An initial list of interventions has been drafted, but we are looking for feedback and especially welcome the addition to the list of any interventions to reduce trade in protected species that we have missed. Please view the list here or contact Nancy Ockendon for further information or any contributions you would like to make.